Nissa Revane found herself woven into an unending stream of living light. It was a place she never wanted to leave, for it embraced and cared for her. It wound around her and supported her limbs, giving her the feeling of weightlessness. After a timeless moment, though, the stream began to disentangle itself. How she hated to see it go. As it floated past her, she noticed that it was actually made up of hundreds of thousands of tiny filaments. It was a glittering river of jewels. It glided so close that she could reach out and touch it. She let her fingertips run through it, and as the tiny filaments passed, she felt each individual essence, all of them unique. Under everything, she felt a great sense of contentment. She wanted to stay like this, connected to the stream, forever. Something hit Nissa from behind, in the back of her head. She reached to rub it. Again. This time in her back. Hard. The stream was caught up on her, caught up because there was a knot—a large, black knot that was preventing the flow, holding the stream back. It slammed once, twice, and again into Nissa’s arm. It hurt. She tried to push it away, tried to shift its course, but it refused to be dissuaded. It made strange sounds, sounds like writhing and gnashing, awful sounds too close to her ear. It was darkening and growing. Soon it would be larger than her. Nissa tried to run, tried to swim away. She reached for the light, but all that was left was the darkness. 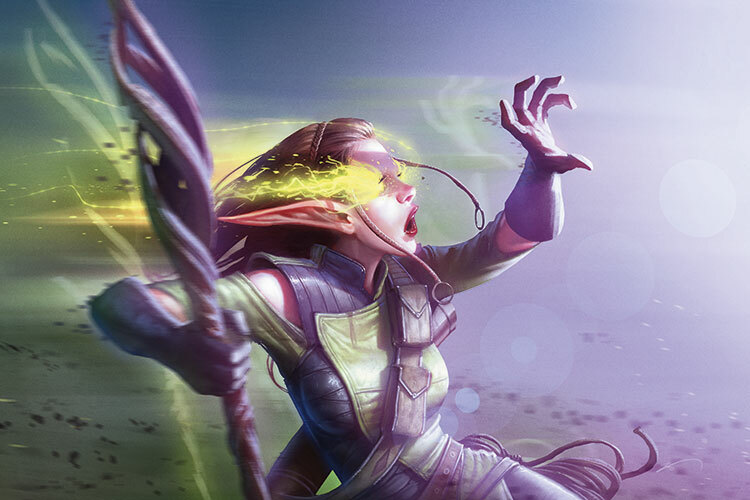 Nissa awoke with a start, screaming and gasping for breath. Her breathing slowed as she stared up at the familiar wooden roof, tracing the pattern of vines that lashed it together. She knew the pattern well, for this was not the first time she had awakened in her bed after a vision of darkness. As she slipped further into this reality, her other senses came back to her as well. She could smell the aroma of her mother’s stew. It must have been warming over the fire. Had she missed dinner again? She could feel the evening’s dampness on the air, a dampness brought on by the rain, which she could hear pattering on the roof. The sound of the rain was gentle and calming, but there was something turbulent under it: two voices, hushed and tense. She pushed herself up to sitting and pressed her long elf ear against the wall. He was talking about her vision! That meant he had heard. Nissa cursed herself for screaming so loudly; she knew the trouble it would cause. “What do we do when it comes looking for her, for us?” Numa asked. Nissa shivered, the dampness on her skin turning cold. “Zendikar is not vengeful,” her mother argued. Nissa pulled her blanket up around her. This was not the first time that she had heard her mother and Numa argue about her visions, but she had never heard Numa speak in such a hard tone. “Are you…are you sending us away?” Her mother’s tone was disbelief. “I have no choice, Meroe. I cannot risk Zendikar’s retribution. I’m sorry. Truly, I am.” Numa’s words were followed by the sound of his retreating footsteps. Her mother’s hurried footfalls followed. Nissa clutched the corner of her blanket, rubbing the soft spot over and over again. Her mind reeled. Numa was going to kick them out of the Joraga camp. Where would they go? What would they do? More, how could he do that to her mother after all Meroe had been through? Nissa’s heart ached at the thought of her mother suffering. She wanted to hate Numa, but she couldn’t blame him for protecting his people. He was right. She was a danger, the last of the animists and the only one remaining who still had visions. Her mother told her the visions were a gift. She said they were Zendikar’s way of talking to Nissa. But her mother did not understand. Meroe had never seen the darkness, she had never heard the writhing and gnashing, she had never felt the suffocating pressure, so she could not know. 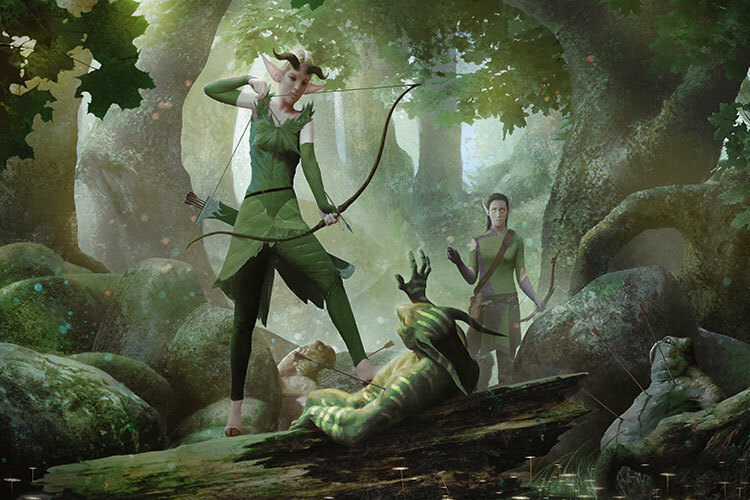 For many moons now, Nissa had believed that Zendikar was hunting her, and now Numa’s words confirmed her fears. Her visions were not a gift, they were a warning. Zendikar was speaking to her and its message was clear. It would have its retribution. It would finish what it had started with the animists. The dark knot was coming for Nissa, and that meant that anyone near her was in horrible danger. Nissa slipped out of the house before her mother returned. The darkness was complete, the stars hidden by the clouds that were still sprinkling the land with rain. She packed light—her staff-sword, bow, arrows, bedroll, and a few provisions—she’d hunt on the way. The only other thing she brought with her were the bits of nature magic that she knew, which somehow seemed less impressive now as she was slinking through the darkness alone. When her feet wanted to turn around, she reminded herself of why she was leaving; she would not lead the horror to those she loved. When it came for her, it would find only her. Nissa didn’t stop or even slow until she saw the first hint of deep, blue light through the trees. She had kept such a pace that she would be ahead of any Joraga trackers by at least half a day, and that’s only if they could find her trail. But they wouldn’t. She had been using her nature magic to cover it, putting every last blade of grass back in its place. She glanced over her shoulder to reassure herself. Her spell had worked flawlessly; there was no sign that she had travelled here. Not even the most skilled tracker would be able to find her. As the reality of that thought set in, Nissa’s mouth went dry. She took a deep breath, forcing down the feeling of dread, and turned forward to press on. “What the…?” Nissa squinted at the ground. Was it a trick of the light? She shielded her eyes from the dim pre-dawn. It was still there. A shimmering stream extended out in front of her. Nissa gasped. It was just like the stream of light from her vision. “No.” Her stomach clenched. It was happening already—the stream would lead the dark knot right to her. 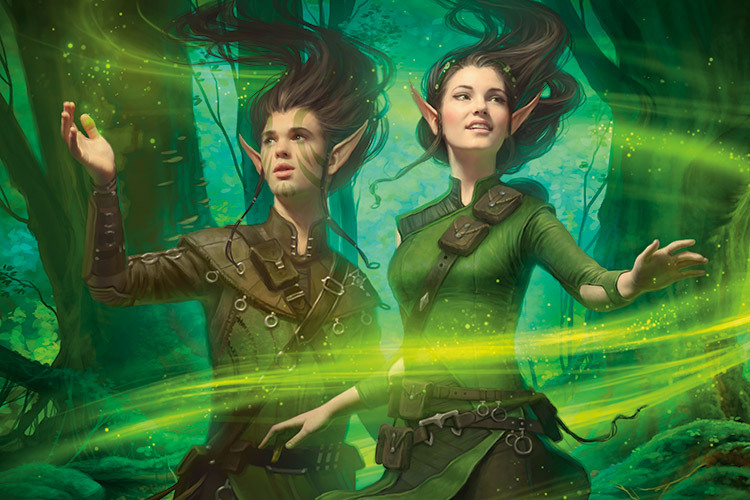 “Stay away from me!” Nissa kicked at the stream and took off at a run in the other direction. But there it was in front of her again. She somersaulted and changed course. After two steps it was pointing to her once more. She turned a third time and leapt over a log. This time it was there before her first foot landed. When the sole of her boot touched the ground, the glowing stream swirled up to meet her. Before she could turn again, before she could run, it wrapped itself around her like a cocoon. It happened so fast that Nissa’s struggles were pointless. She went to reach for her sword, but her sword hand was bundled up in a sparkling tendril, floating weightless like her other limbs. She tried to twist her way out, she tried to panic, but neither worked. The embrace was so comforting, so calming that she couldn’t help but soften into it. It was telling her it would not hurt her, that it was not evil. But it was; she knew it was…wasn’t it? Her confusion turned to awe as the stream enveloped her completely. 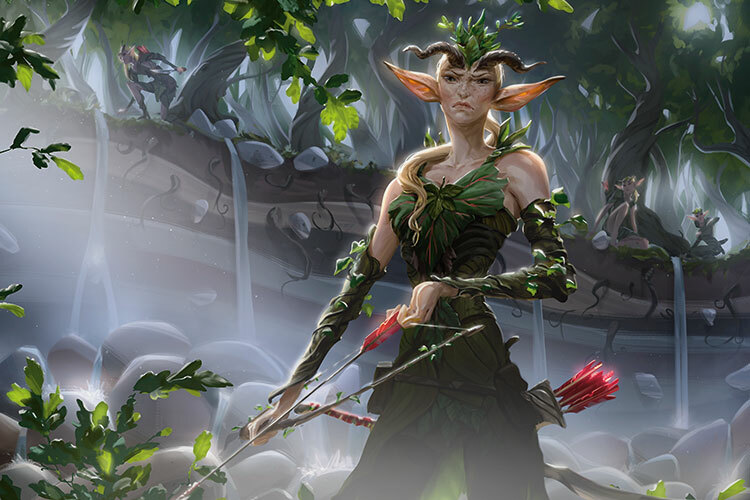 In that moment, deep in the heart of the Joraga forest, Nissa Revane connected with Zendikar. She understood then. The glowing stream of light and life was the land’s soul. And it was the most beautiful, most wonderful thing Nissa had ever touched. It eased her into a vision, guiding her gently into its thoughts, its memories, and its hopes. 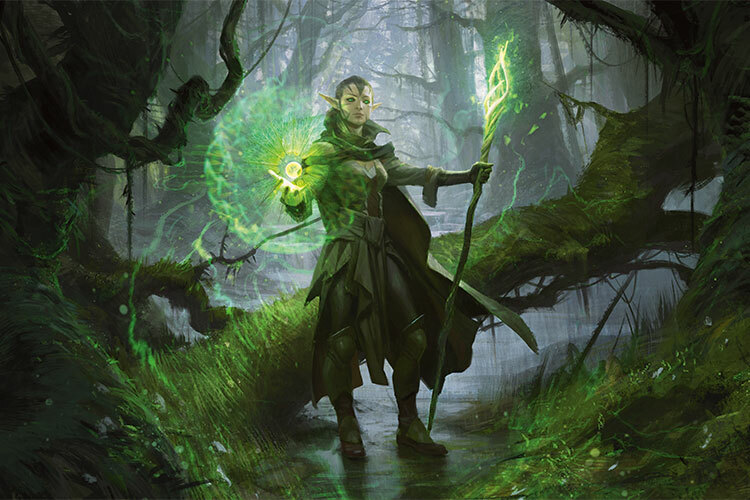 The stream swirled around her, each of its jewels sparkling, but Nissa understood that they were more than just jewels; each sparkle was a living being. 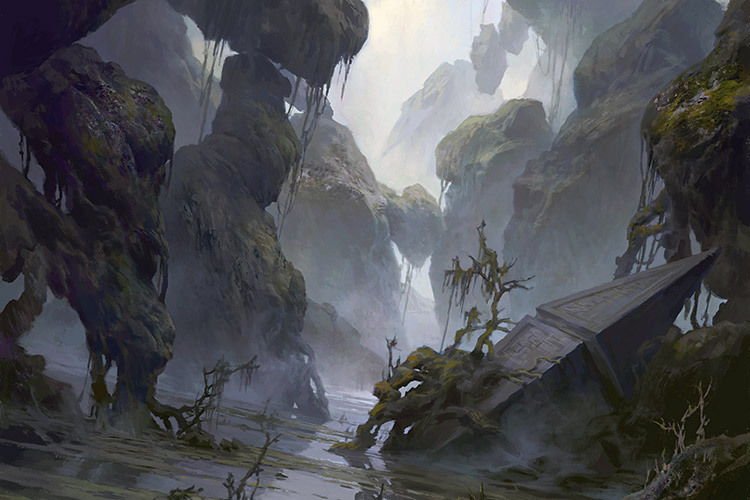 All the beasts, plants, and races of Zendikar were a part of the endless stream. What was more, the stream was not just a stream, it was the land. It was the contours and the depressions. It was every blade of grass, every pebble of dirt, every grain of sand. It was everything, and it was all connected. The glowing creatures frolicked around her, coming into focus as they passed by her eyes. She watched the baloth roar, the great jurworrel tree wave in the wind, the long, slender nectar snake slither across the ground, and the barutis bird soar through the sky. And then she saw an elf, an elf that looked very familiar. It was a perfect, crystalline version of her. The glowing Nissa walked along the streaming land. Each step she took sent shimmers through Zendikar’s soul. She followed the stream through the forest, picking up speed as she went, running faster, faster, leaping, and then flying. She crossed a desert, a bog, a mountain range, and then a hundred other places that flew by too quickly for Nissa to recognize. Finally the stream slowed and the glowing Nissa came to rest. She stood on a rocky ledge, looking up at a mountain peak. Inside the mountain, Nissa could hear the horrid writhing and buzzing, and she could sense the dark knot. She recoiled, fear rising up inside of her. Had this all been a trick? But the glowing Nissa did not seem to be scared. She held her ground. She raised her hands, her palms facing the darkness. Her lips moved, but Nissa could not hear what she uttered. And then, suddenly, a bright light blasted through the whole vision, consuming everything—the mountain, the knot, and the glowing Nissa. When Nissa woke, the cocoon was gone. She was on the ground, and she was looking up at what seemed to be a pair eyes. “Nissa?” The mouth formed her name again. It took another moment before Nissa recognized the voice. “Mazik?” Nissa struggled to sit up. “Yeah, I’m all right. I…wait.” Nissa blinked up at her friend. “What are you doing here? Were you following me?” She jumped to her feet, her ears flicking around for signs of approach. Mazik pointed down to Nissa’s feet. The glowing stream of light was back. It was swirling around her legs playfully like an eager pet. Nissa’s heart soared at seeing it again. “Hello, Zendikar,” she said. The stream trilled with excitement and shot up, whirling around her and Mazik like a funnel cloud. It blew their hair into the air and filled them with a feeling of enchantment. Before their hair even had a chance to settle, the light was tugging on their wrists, asking for them to follow. “Okay, okay, we’re coming,” Mazik laughed. Together, they followed the stream of glowing light deeper into the forest. They agreed without having to discuss it that they would travel together. The stream of light, it seemed, wouldn’t have it any other way. Mazik could see it as long as Nissa was close by. If he wandered off to hunt or forage he reported that he lost sight of it, but as soon as he returned to her side, the path glowed for him again. Like an excited child, it showed them all the secrets and beauty of the forest: hidden alcoves, trees that twisted so high into the sky that their tops were lost to the clouds, vines that danced, and babbling brooks that sang sweet songs. It was like they were in a new land, a land of wonder. Nissa felt that she, too, was new. The bond she had made with the soul of Zendikar grew stronger with each step, and so did her magic. When she cast spells, even simple ones, they burst forth with flourish. The jaddi nuts she enchanted to light their way at night arranged themselves like the stars, forming the shapes of animals to guide them. When they encountered an angry tree stalker it only took a slight flick of her wrist to change its course and free them of worry. She moved the leaves of the trees to shelter them from rain, and she drew up the sweet nectar of the flowers to lift their spirits when they grew weary. But even amid all the wonder, Nissa couldn’t entirely shake the foreboding feeling that crept into the corners of her stomach. With every step they took they were getting closer to the darkness. And when they arrived at the mountain she would have to face the knot, for that’s what the glowing Nissa had done. But how? 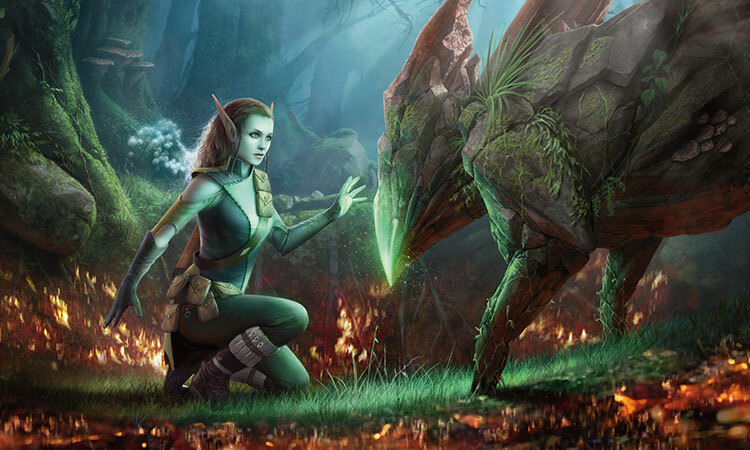 After two days in the enchanted sanctuary, Nissa and Mazik reached the edge of the forest. The world beyond fell away, opening into a canyon land of red rocks, dry trees, and wind-scoured mesas. As they stepped out, it felt to Nissa like she was leaving home all over again. But this was where the stream of light was going; this was where it was leading her. The elves were not used to the bright heat of the sun. Their delicate skin was so accustomed to the protection of the forest’s canopy that it turned hot and red within hours. They drank all but a few drops of the water they were carrying before the first nightfall, and their feet ached from walking on the hardened ground. It only shimmered in response, leading them on through the canyon. By midday on the fourth day, Nissa was so hot and thirsty that, when they crested a hill and saw a vast marshland below, she let out a whoop of pure joy. The elves raced down the hill to the marshland, kneeling at the edge of a brackish bog. Nissa used her magic to draw out streams of pure, cool water. They drank until their bellies were full, and then they snacked on the wild mushrooms that grew along the bank, and drank some more. Nissa was utterly content until Mazik spoke. “Now we have to cross that?” he asked, pointing ahead. It was a rhetorical question; he could see the shimmering stream just as well as she, and it very clearly went straight through the bog. “At least there’s water…” Nissa offered. She tried to sound cheerful, but her voice was tinged with fatigue. “Wasn’t there another way around?” she whispered to the glowing stream. It twittered and shimmered and tugged her along as though it was completely unaware of their current predicament. And perhaps it was unaware, Nissa thought. It was the soul of the land after all; all of the land, not just part of it. The bog was as much a part of Zendikar as the forest was. With that thought came a sense of compassion, and Nissa’s eyes opened anew. As they picked their way deeper into the marshland, Nissa formed a connection with it. She saw the beauty in the moss-laden trees, felt the magic in the mists that rose up from the brackish waters, and swayed to the song of the swarms of lion flies that circled them. She never would have believed a bog had so much to offer. “Uh, I think we should get out of here.” Mazik’s voice came from behind. Nissa spun at Mazik’s shout. As she did, she caught a biting scent in the air: oil, unguents, death. Mazik grabbed her arm and pulled her along, high-stepping through the muck. “Where are they?” Nissa glanced about frantically as they ran. A hiss from behind made them both turn. Five vampiric horrors loped after them. The biggest one, a shirtless male streaked in blood, led the charge. “We have to get out of the bog! Help us!” Nissa cried as they ran. The soul of Zendikar responded to her need. The stream of light cut a new path through the marsh, one Nissa knew would lead them to safety. She ran like an arrow along the glowing stream, faster than she had ever run. The connection she had made to the bog allowed her to move through it like she did the forest; she leapt from log to log and swung on low-hanging vines to cross a dark ravine. She felt the vampires’ presence recede even before she broke through a thick line of trees and out into a clearing. Nissa’s racing heart plummeted. “Mazik!” Her call fell flat against the thick bog. Suddenly a sharp, strained cry sounded from the trees. “No!” Nissa sprinted back into the bog. She did it without thinking, but a few steps in, her thoughts caught up with her feet; she was most certainly running toward her death. She shook off the cold fingers that tried to pull her back. She wouldn’t go back, not without her friend. There were ten of them now. The reeking, shrieking vampires were circling one of the tallest trees. Nissa looked up into the branches. Mazik was clinging precariously to a bent perch, his arm bloodied. With a spiting hiss, two of the nearest vampires sprang up toward him, securing handholds on the lowest branches. Nissa hadn’t realized she was going to call out. The sound of her voice startled the vampires too. They turned as one, and seeing her, their hungry eyes locked onto their new prey. Nissa only had the space of a few heartbeats to react. Her instincts took over. She reached for the land, for Zendikar, channeling its power. She hoped to pull up a few roots, enough to make a barricade, enough to give her time to run. But rather than roots, she pulled up what felt like an entire tree. Though as it emerged, she realized it wasn’t a tree at all, it was the land itself. It rose up in a wave, growing out of the muck and taking on form. It was as tall as a baloth. It charged at the vampires, teeth gnashing and legs flailing. It took the first two out merely by crashing into them. It wasn’t until Nissa felt the pull at her fingertips that she realized the elemental was under her control. She directed it at a cluster of three vampires. It swiped with its massive paw, knocking them to the ground in a blast of green light. There were five left. Nissa turned her elemental on them. One tried to run, the big one, the leader. 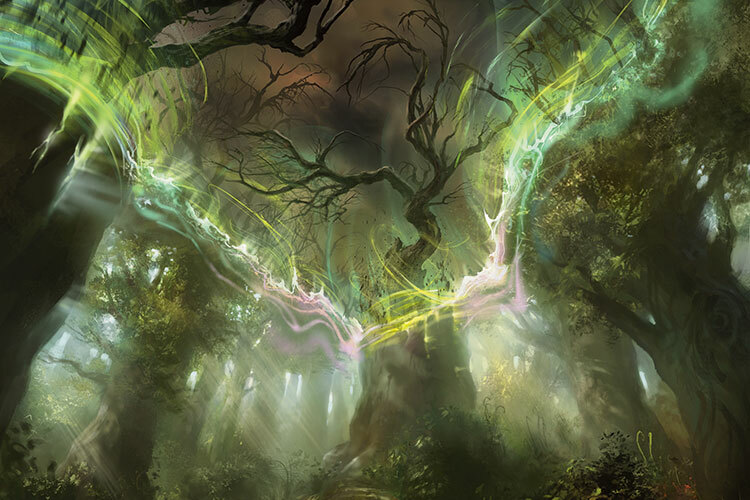 “Oh no you don’t.” Nissa summoned the bog’s dangling, dancing vines. They snapped to attention, making themselves into spears, and they pierced the vampire straight through his heart. “Nissa? Nissa!” Mazik clambered down from the tree and ran to her with his arms open. Nissa stepped into his embrace. They stayed that way for a long time, their hearts pounding against each other. “Don’t mention it.” Nissa tried to laugh, but it came out more like a hiccup. “So yeah, you really…” Mazik pointed at the fallen vampires. “And then you…” He gestured to the land. 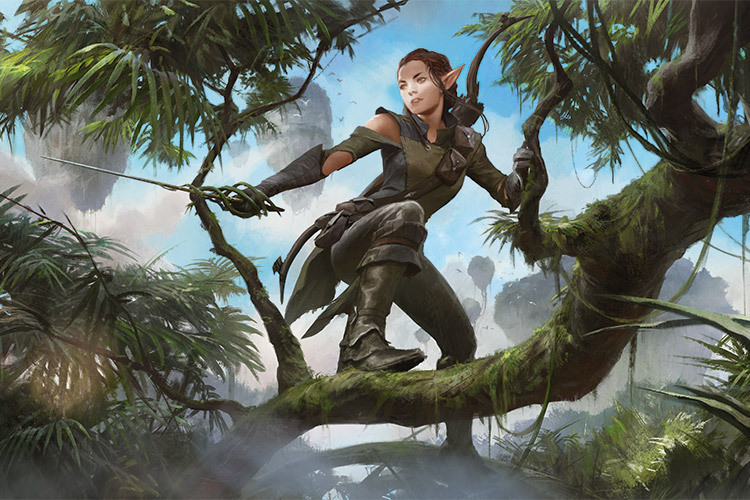 “Yeah, what was that?” Nissa mused. They broke free of the swamp just before dawn. Nissa missed it more than she thought she would. She had grown attached to the muck and the saggy trees and the moss that covered every surface. Now they were in the foothills of Akoum, yet another new part of the land to learn. Mazik encouraged Nissa to practice using her new powers. She agreed; it felt like the right thing to do. To hone her skills, she called together the detritus that littered the ground and lifted it to form a hovering canopy that shaded them, sending crevice miners and trench giants alike scattering away. She moved enormous boulders that blocked their path, and she made stairways and bridges out of the land so they could cross the deep canyons. Mazik was convinced Nissa's magic was the key to destroying the darkness. He repeated back to her what she had told him of her most recent vision, citing the way that the glowing Nissa had lifted her hand and muttered what he thought must have been a spell. Nissa wanted to believe him; she wanted to trust that she would be ready when they got to the mountain, that she would be strong enough, powerful enough to face the dark knot. She wanted to believe that she could defeat it, because she had to; Zendikar was counting on her, she could feel it in her soul. It happened deep in the forested mountains of Akoum just moments after Nissa had calmed a charging hurda’s violent tantrum. She came up short. “What is it?” Mazik asked. Nissa didn’t answer. She scanned the trees in front of her, searching, but it was gone. The glowing stream was gone. Nissa knelt, feeling around for her connection, for the glowing soul, but there was no trace of it. “I don’t think so, I…” Nissa’s words were cut short when the land shifted beneath her. The shift was subtle at first, but very quickly the unstable feeling of vertigo grew along with a strange sense of incoherence. Nissa realized it in the same moment Mazik said it. “The Roil! It’s happening!” He ran for the cover of a rocky outcropping that was protected by a large tree and Nissa followed. Nissa had heard stories of the Roil, the force of Zendikar that consumed everything in its path. The stories didn’t seem to be exaggerations. Rocks were raining down around them and the land was shuddering and undulating like the violent waves of an ocean. The elves lost their balance and tumbled to the ground. Nissa reached for Mazik’s hand and together they scrambled under the overhang. The world around them turned on its head. Trees twisted and bent, jutting out from the ground at odd angles. Boulders popped high into the air and slammed together, cracking and splitting and then hovering like long, jagged teeth. An immense force lurched and snaked through the land itself like a blind madman; roots, rocks, and soil warped and folded to its will. “Nissa, you have to do something!” Mazik was looking to her like she held the secret, like she knew what to do. But she didn’t. Her connection to Zendikar was gone. She was just as scared as he. Another rock rained down and then another. If she didn’t do something, they would be buried alive. And then all at once it came to her, an overwhelming flood. It was cold and oppressive; it was fear. Nissa had found her connection, she had found the land, and the land was terrified. She could see it then; the Roil wasn’t an alien force; the Roil was Zendikar’s reaction to the dark knot. It was the land rearing like a spooked horse. So horrified was it of the darkness that it had lost itself to fear. But the land did not respond. If anything it bucked more. “It’s not working!” Mazik cried. Boulders crashed into the overhang above their heads, sending chunks of rock raining down on them. It wouldn’t hold for much longer. “Nissa, what do we do?” Mazik’s voice was filled with panic. Nissa closed her eyes. She did the only thing she could think to do: she began to hum. It was an animist song, the tune that her mother had hummed to her so many times. She dwelled on each note, infusing it with peace, comfort, and reassurance. When the song ended, everything became still and silent. Nissa opened her eyes. The land had ceased moving mid-wave. Trees were caught tilting out like elbows. Rocks were paralyzed half-way up their trajectory, and trails of dirt hung like stars in the night sky. It was as though time had stopped. And there before her was the glowing stream. “You’re back,” Nissa whispered. She offered her hand. Tentatively, it rose up to meet her touch. Uniting with Zendikar was everything. Nissa had not realized how empty she felt without it until it returned to her. Now she was whole again; now she was home. The stream warmed in thanks. The stream swirled around her fingers and then, with a quick flick, it dove down into the land. Nissa worried that she had scared it off again, but a heartbeat later, the land began to pop and tremble. It called to it all of the free bits and pieces: leaves, grass, twigs, dirt, and stone. They came from everywhere, rushing toward one singular point as though they couldn’t get there fast enough. First a head emerged with a long snout cut out of rock, then a neck followed by two stocky legs. Nissa took a step back as a fully formed elemental stepped out of the earth. Nissa blinked at the sound of Mazik’s voice, and with her blink, time resumed. But the chaos did not. The land calmed, the trees and the rocks fell back into place, and the wind picked up again. The elemental stood before them. Its nose was glowing; Nissa recognized the glow as the light of the stream. Zendikar had come to her. Even here, even in this place so close to the darkness, even though it was scared—it had come to guide her. Nissa and Mazik followed the elemental just as they had followed the glowing stream. It led them up into the mountains and through the high, jagged peaks known as the Teeth of Akoum. Nissa had a sense that she had been here before. Certain rock formations seemed familiar and images from her visions flashed before her. They were getting close. For days they traversed the mountainscape, taking breaks only for the necessities—to hunt and forage, to eat, mostly slugs, to refill their water supply, and rarely, to sleep. They couldn’t sleep much, and when they did they both had nightmares, nightmares of painful, writhing darkness. Nissa worried about Mazik. His steps had slowed and his breathing grew heavier each day. She kept a close eye on him, for it seemed that the knot was hurting him more than it was hurting her. Early one evening just as the sun was dipping under the highest peaks and the sling-tail nighthawks were beginning to rustle in their perches, the elemental stopped. It pawed the ground anxiously and reared its head, nodding at a tall column of rock. “What is it?” Nissa asked, inching closer to the corner. The elemental backed away. Nissa peered around the rock and her breath caught. Huge, diamond-shaped stones floated in the air, hovering in unsettling stillness, each one spaced with an unnatural perfection and held there by what must have been an immense magical force. The sun reflected off the strange markings on their flat sides. They formed a ring around the highest peak of Akoum. 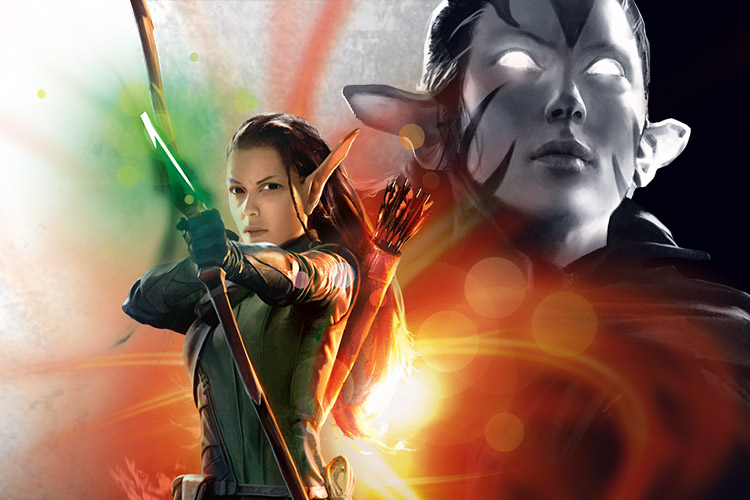 “We’re here,” Nissa said. She knew the peak well from her vision; that was where the dark knot was. “Nissa.” Mazik’s voice was weak. She turned to see him stagger and fall. “Mazik!” She rushed to him. “Something’s wrong. I don’t know…” He clasped a hand his to his face as blood dribbled from his nose. Nissa looked from Mazik to the elemental that was bucking and trembling. It was clear to her that neither could go any further. Whatever she did next, she would have to do alone. Her heart broke at the thought of leaving them. “It’s okay, Nissa.” Mazik spoke in a tone that said he understood. “I want you to go. I’ll be okay. We’ll be okay.” He rested his hand on the elemental’s thick, rocky leg and its trembling lessened. “You’ll be okay,” Nissa agreed. She helped Mazik up onto the elemental’s back, and she laid her hands on both of her friends. “Be safe,” she said, sending a calming stream of magic to them. “Be strong, Nissa Revane,” Mazik whispered. The elemental’s nose glowed as it padded away down the path. To stop herself from following them, Nissa turned back to the mountain, and she took her first step toward the darkness. After the first step, she did not stop. She could not allow herself to pause or she feared she would not work up the courage to continue. She approached the ring of glowing stones and then she hurried under them, skirting their shadows. Once inside she slowed and stared up at the towering peak, the highest peak of Akoum. This was it; she had arrived. The dark knot was here waiting for her. It buzzed and writhed, making noises that scratched at the inside of her ears. She hated it then. 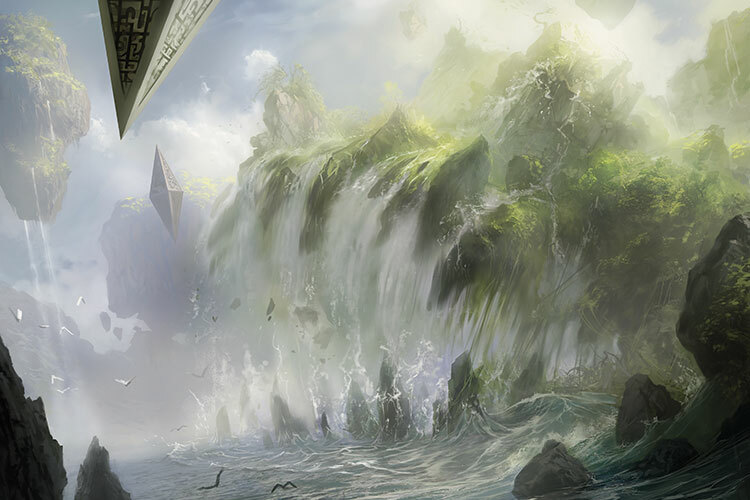 She hated it for what it had done to Zendikar, for what it had done to the animists, and for what it had done to Mazik. She circled the peak, climbing slightly higher with each step. She was feeling out the knot, planning her attack. Though there wasn’t much to plan. She had decided days ago that when the time came she would do just as the glowing Nissa had done. And so she did. She found the spot, the same ledge that the glowing Nissa had stood on, and she planted her feet on the ground. “I call on you now, Zendikar,” she said. “I am here to rid you of this darkness.” With that she reached down deep into the land. She knew that the stream would not be easy to find here, that it would not dwell so close to the knot it feared, but she also knew that it would come to her call. It seemed to understand the importance of the moment, for she did not have to reach quite as deep as she thought to find it. Once she connected with Zendikar she drew upon its power. She pulled it into her, as much power as she could hold…and then more. She didn’t stop until her chest felt as though it would burst. Then she lifted her hands, oppressively heavy with power, and sent forth a blast so great that the entire sky filled with the energy she had summoned. She screamed with the effort and stumbled back, straining to hold her hands up as the power flowed from her. When the last of the magic had drained from her fingertips she sucked in a long breath and looked to the mountain. She expected to see a ruined peak, a crack from which darkness was oozing out; she expected to face her enemy, and for that she was prepared. But she need not be. The mountain was unblemished and the darkness was still writhing inside; it was as though her spell had done nothing. The dark knot contorted and gnarled in a way that sounded like evil laughter. The scratching cackle pulsed forth in a shockwave of madness that rushed Nissa, piercing her eyes and burning through her psyche. It showed her everything. She saw what was inside the mountain, she saw what it wanted, she saw what it had done. Nissa screamed again, this time in terror, and she crumpled to her knees as wave upon wave of monstrous madness washed over her. Just when she thought she would not survive another wave, something inside her cracked, like an egg breaking open, and a warm, thick, all-consuming force spilled out of the crack. 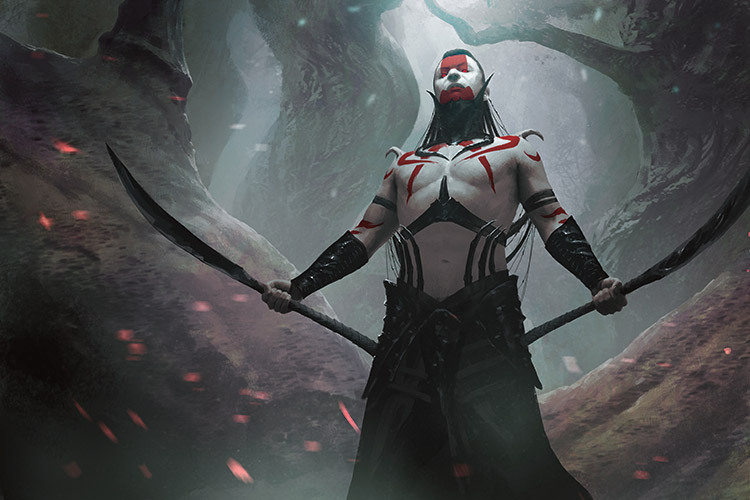 It surged through her with an unmatched intensity, greater than the madness of the monster—capable of ripping her apart from the inside, capable of ripping apart the very fabric of Zendikar. It was over then. This was the end for her. She had not destroyed the darkness; it had destroyed her. What happened next was impossible for Nissa to understand. Excruciating pain shot through her, and Nissa was sent hurtling out into a void. She saw light and energy, swirls and holes. There was no up or down. There was no land or sky. It was black and then it was bright. She was tumbling, but there was no way to stop; there was nothing to hold on to. If this was her end, she wanted it just to end. She didn’t want to suffer anymore. She squeezed her eyes shut and curled into a ball, clutching her legs to her chest. And then suddenly there was solid ground beneath her. It had come out of nowhere. Had she landed back on the mountain again? When her heart settled slightly, she risked cracking her eye open, the right one. The left opened only a moment after the right; there was too much for just one eye alone to see. The colors were vivid and unprecedented, in shades she had never seen before. The shapes of the plants and trees were also foreign, their leaves and the texture of their bark unidentifiable. And then there was the smell. It was at once sweeter and heavier than any scent she had ever known. She was not on the mountain. She was in a forest, but it wasn’t a forest on Zendikar. Something told her she was very, very far away from Zendikar. There was a flutter of relief that accompanied the realization; she was not in the same place as the monster. She had escaped the dark, knotted madness, escaped the pain. But the relief was followed closely by a sense of failure. She had broken her promise to Zendikar. She had faced the darkness, and she had lost. “No!” Nissa slammed her fist into the ground in rage. When she did, the land reacted. Something inside of it jumped up to meet her and it pulled her in. She fell into this new land. Lorwyn, it called itself. It was nothing like Zendikar. The only thing the two worlds shared was that they were both worlds, beyond that they were as different as two snowflakes, each with its own markings, its own ways, its own inhabitants. 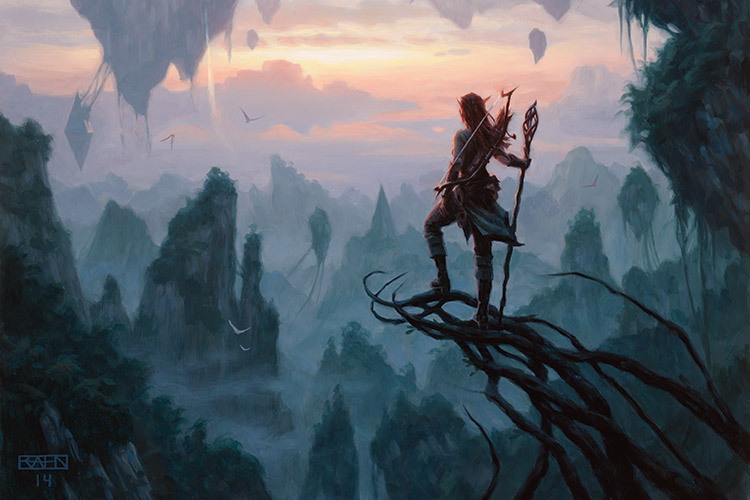 Where Zendikar embraced her, this land was standoffish. Where Zendikar was playful, this land was somber. But they were both in pain. How? Nissa wondered. How could there be so much pain, so much darkness, so much evil? The evil in this land was not far under the surface. It was bubbling up, ready to release; a thousand shadowy spiders had been growing and now were chewing through their silken egg casings. Nissa shuddered. “Get back.” She swatted at the shadows. A wave of crawling darkness washed over Nissa. 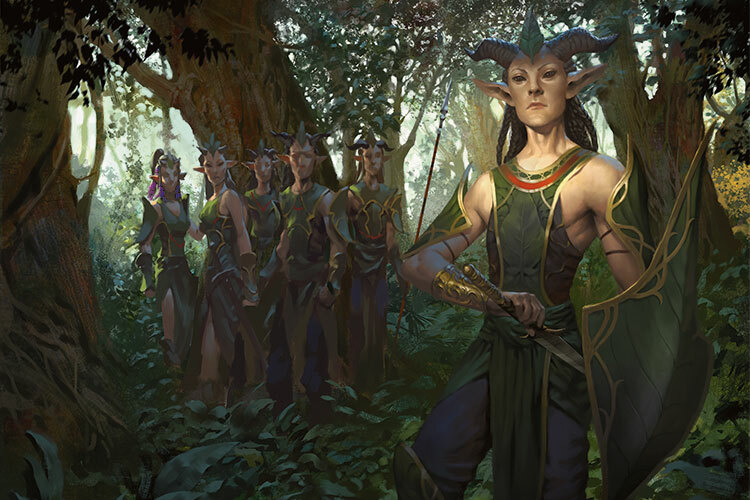 Nissa woke to a circle of scowling faces and realized that she had been screaming, again. The faces were elf-like, but the beings had horns growing out of their heads and hooves instead of feet. Their swords and spears were leveled at her. The group muttered as they looked at Nissa with a mixture of suspicion and curiosity. “Stay back.” This voice was firm and strong and it came from a tall, poised female, clearly the leader. She brandished her sword, its tip coming inches from stabbing Nissa’s nose. Nissa started and let out a small squeak. “Y-your hunt?” Nissa asked, confused. “Eyeblights on the right!” one of the elves shouted from behind the leader. “Now’s your chance, you strange, beautiful, green-eyed creature,” the leader said to Nissa. “Take up your blade and prove yourself.” With that, she charged into the thicket of trees on the right. “My blade.” Nissa unsheathed her sword. “Yes.” Something felt so right about this, about the charge and the hunt. This was what was supposed to happen when a land was threatened. She ran into the trees after the hooved elves of Lorwyn. A male elf, not much older than Nissa, caught her eye as she entered. He held up his hand and motioned for her to move to the fringe of the trees. She did so without making a sound. Together, they crept along the perimeter of the thicket. Nissa could hear a grunting, yapping sound like wild pigs or goblins. “Nice to meet you. It looks like you’ve caught Dwynen’s eye. She doesn’t make a habit of inviting strange elves along on her prized hunt. But I can see why she let you tag along. You’re one of the most beautiful creatures I have ever seen.” Galed leaned in as he spoke and breathed in Nissa’s scent. Nissa shuddered at his closeness. There was something intoxicating about the moment—these elves, this place, the hunt for evil. In a way, she felt like she was finally where she belonged. “There it is!” Galed said. A heartbeat later he sprang out from the trees and jabbed with his spear. Nissa pounced behind him, landing next to him just in time to see him slash the throat of a small creature that yelped in fear. “There’s more! Get them!” Galed pointed. Nissa dove on top of another small creature her blade raised, ready to strike. But something stopped her. This wasn’t one of the evil spider-creatures from the cocoon in her vision. This was a squat creature with greenish-gray skin that was all lumpy and warty. Two eyes bulged out of its head in a toad-like masquerade, and its mouth flapped open and shut as it tried to make a sound. Nissa was frozen, her hunter’s instinct halted by the look in its eyes. Galed didn’t hear a word; he was lost in the heat of bloodletting, dispatching one creature after another. “Galed! Stop!” Nissa ran for Galed as he cornered yet another one. The small creature squealed for mercy. “Don’t hurt it!” Nissa cried. But she was too late, his spear sunk into the creature’s chest. “No!” Nissa sank to her knees next to the small body. The creature blinked up at her, its eyes wet and lost. Nissa’s hands fluttered around it, unsure of where to move or what to do. There was nothing to do. She rested her palm on its forehead. “I’m sorry,” she said. And in that moment she connected with the strange creature. She felt its place in the glowing stream of life that was Lorwyn’s soul. She felt its hopes and dreams, its fear; she felt its pain and suffering. And then she felt it die. “And you’re insane.” Galed looked down at his chest. Dwynen drew back her bow. “How dare you?” she said. “How dare you come to my forest and tell me what I can do?” She nodded and Galed lunged at Nissa. Nissa dodged and spun away from the attack. She held up her blade to block a second strike, but it never came. Both Galed and Dwynen stood shocked, staring ahead, their mouths hanging open. Nissa turned slowly, dreading what she would see. Her worst fears were realized. A towering wall of twisted, squirming night was approaching them. As it moved across the land it left dark destruction in its wake. “No!” Dwynen gasped. “Not my Lorwyn. Not my beautiful Lorwyn!” She summoned her magic and blasted a spell at the approaching darkness. Galed followed suit. Nissa stepped up next to them, reaching down for her own magic. “What are you doing?” Dwynen glared at Nissa. “You’re not helping. This is all your fault! Witch!” In one motion, Dwynen threw Nissa to the ground and landed with her knee on Nissa’s chest. Dwynen pressed a nocked arrow to Nissa’s throat. “You destroyed my world!” She moved to release the bowstring, but just as she did, the wall of darkness touched her. Dwynen was paralyzed, caught in the Great Aurora of Shadowmoor. She changed before Nissa’s eyes, darkening and hardening. Before the dark wall could touch her too, Nissa slid out from under the tip of Dwynen’s arrow, sprang to her feet, and ran. “Where are you going, pretty little elf?” the dark voice hissed in her mind. Nissa didn’t look back. She just kept running—she kept running and thinking of Zendikar. Nissa’s steps slowed, but for just a heartbeat. She forced herself to press on; she was only barely avoiding the wall of shadow. “Zendikar, Zendikar, Zendikar,” she chanted. She felt the spark inside her, the one she had felt at Akoum before she had been hurtled into the void. It had ignited again and it was tearing her apart from the inside. No. She would find a way. She just had to get there. Nissa charged through the pain toward the place where she could feel the world opening to let her out. The void had opened. It was right in front of her, and Nissa stood at the threshold. She could see the swirling eternities on the other side. All she had to do was step through. But she hesitated. That was the thing though, wasn’t it? If she stayed, she would never leave. She would be powerful, yes, but she would lose herself, and she would lose her connection to her land. If she stayed, she would lose Zendikar. In Nissa’s moment of clarity, a thread extended before her. It was like the glowing stream of light she had come to know so well, but much brighter and thicker. It ascended to meet her. This was her path. It was the very thing that she had been searching for all her life. She reached out with a trembling hand and took hold of it. It pulled her with great force through the tear in the fabric of Lorwyn and out into the void. As she tumbled into the vast space, she saw her path unravel through the eternities. It would lead her many places, but for now it would lead her home.